For most of us, a home is likely our biggest investment. But, like any investment, a home requires regular maintenance to guard against deterioration and also to ensure safety standards are updated. This is especially true for the chimney and fireplace system of the home. Even though the summer heat still lingers, using your home’s fireplace may be the last thing on your mind, but completing some basic maintenance jobs can ensure your home is ready for the colder moths to come. That’s why summer can be a great time for not only cleaning your chimney, but updating safety standards and installing a new Chimney Cap as well. Along with warm weather, come bugs, insects, and little critters all which love to find refuge in a warm, inviting chimney. 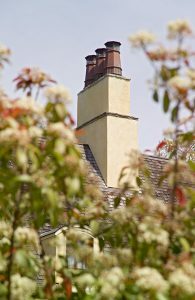 Keep them at bay by installing a European Copper chimney cap to protect the inside. Our chimney pots can also help prevent an excess of leaves and other debris from clogging the chimney during the fall season. The best way to prevent a chimney fire is to have your chimney inspected and cleaned by a CSIA Certified Chimney Sweeps. Don’t skip getting your chimney cleaned just because you waited and couldn’t get an appointment before you wanted to light that first fire. That’s why summer maintenance is so important. Chimney and fireplace problems can quickly go from small and insignificant to major in just a short time. This is another important reason to catch problems early. Have your chimney professionally checked for any problems that need to be addressed. If you need repairs, ask for an estimate and a long-term care plan. As the days get warmer, you may be noticing an unpleasant odor from your chimney. If your chimney is leaking from the heavy rains, it may be mixing with the creosote and causing a nasty smell to come out of your fireplace. Contact a CSIA Certified Chimney Sweep expert to inspect your chimney for leaks and remove the source of any odor. Remember, in spite of summer’s sizzling temperatures, winter will be here before we know it. Act now to ensure building warm, safe fires for your family to enjoy in the colder months ahead!